If you are replacing your clutch kit, it is the perfect time to take a look at your flywheel, and either replace it, or at least having it machined as the clutch kit manufacturer will not supply a guarantee if the flywheel is not machined. Flywheel resurfacing (or machining) can be undertaken for mild wear, but if on inspection it has deep grooves or any radial cracks it is probably time to replace it. 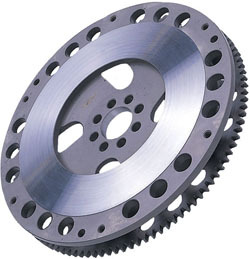 Early clutch failure can result if your flywheel has damage or has warped and you have failed to replace it. Clutch replacement is a big job for your mechanic with the transmission needing to be separated from the engine, making it a perfect time to examine the state of the flywheel. If the flywheel needs replacing down the line, it is going to be a much more expensive fix, as the transmission will need to be taken out all over again. If you are replacing the flywheel, you will need to consider whether you want to keep the same flywheel or go for a lighter flywheel which will improve engine response. Why Chose a Lighter Flywheel? The flywheel, especially if you decide to go with a sports (or light) flywheel assists in keeping acceleration times down, and improving response, particularly in lower gears. Take the time to ensure you are buying quality parts, from a supplier who is recognised and respected. Trying to save a few dollars by purchasing remanufactured parts, will not serve you in the long run as these parts can either have correct fitting issues or higher failure rates. Why risk your safety with either of these potential problems? Look for ‘OEM’ in the description of any parts you are purchasing.OEM or Original Equipment Manufacturer, means that parts are built to manufacturers specifications. All Exedy parts meet OEM Standards. Ordering a replacement light flywheel online is easy, simply look up the make and model of your car on the Exedy Clutch Finder and place your order.